I've never purchased a Justin Bieber scent before so i was intrigued to find out what the scent would smell like. The scent i purchased is the Eau De Parfum, Collector's Edition, 30 ml. The box has a purple design emblazoned all around with Justin's name on the front and lid of the box. The bottle is frosted glass with a gold design placed on the bottle that looks like it is melting and attached to this is a key charm that has the words "YOU'RE ALL THAT MATTERS TO ME. 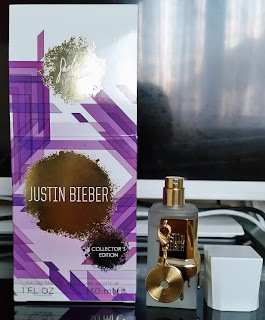 JB"
A personal message to his fans and is the statement behind this scent and why he created it. This is his most personal scent to date. Bergamot, Pear and Passionfruit that really give your senses a fruity mouthwatering experience whilst the heart consists of Honeysuckle, Freesia and Heliotrope that bring beautiful soft florals to this scent that is comforting and will leave you smelling your wrist in delight. The base consists of Golden Amber, White Musk, Sandalwood And Apricot Nectar bringing a unique depth to this scent and blends all the notes together nicely. The scent lasted all day on my wrist and i can smell the scent from the white lid on the bottle. If you like your scents that are a soft musk with a hint of sweetness you will love this! If your a dedicated floral scent wearer then this might not be your scent. I was actually surprised at how well this scent lasted all day and how excellent this scent smelt! Have you tried any of Justin's other scents? X Neal.